Dahl was impelled to build Node.js after reviewing a file upload progress bar at Flickr. The most interesting thing was browser did not know how many files have been uploaded and for that the browser needs to question the Web server. Dahl scrutinized limited possibilities of the most well-known web server in 2009, Apache HTTP Server to deal with lot of concurrent connections (up to 10,000 and more) and the widely recognized way of creating code (sequential programming) is that code either blocked the entire process or proposed multiple execution stacks in the case of simultaneous connections. Node is using NPM(Node Package Manager) for package download. NPM is most recommended package manager for open source. Another package manager you can use is bower, etc. 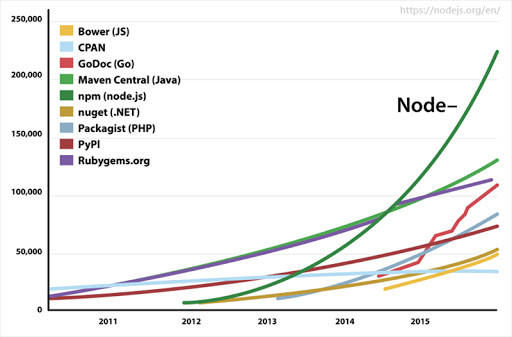 After analyzing many statistical reports, we have found that Node.js is the fastest growing and most significant development language in the current scenario. With 3.5 million users and annual growth rate of 100%, Node.js is getting fascinated everywhere. Below survey reveals the type of development work Node.js users do, the other technology they use with Node.js, which languages they plan to use more, and which they plan to use less in the coming months, and more. Following graph shows the usage of a node by different package managers for downloading node-packages. And we have found another survey where nodejs was being used in the following fields of development. Why Node js is so popular ? Asynchronous and Event Driven − All APIs of Node.js library are asynchronous, that is, non-blocking. It basically implies Node.js based server never waits for an API to return data. The server proceeds to the next API after calling it and a notification mechanism of events of Node.js assists the server to get a response from the previous API call. Single Threaded but Highly Scalable − Node.js uses a single threaded model with event looping. Event mechanism helps the server to acknowledge in a non-blocking way and makes the server extremely scalable as opposed to traditional servers which create inadequate threads to handle requests. 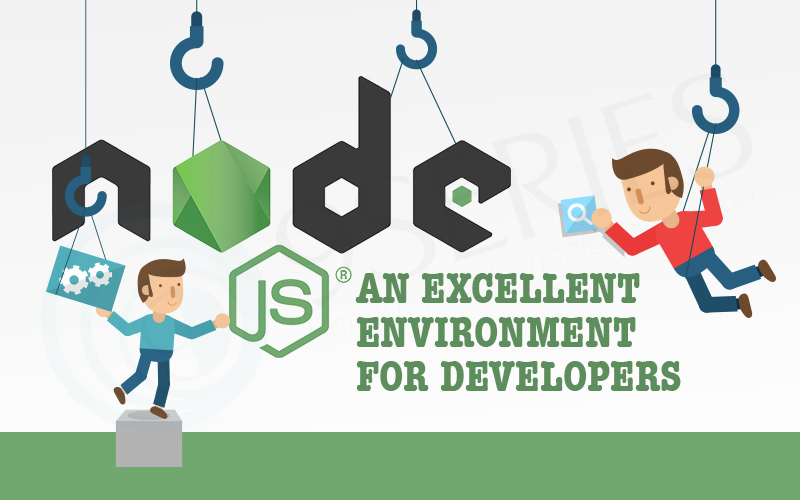 Node.js uses a single threaded program and the similar program can provide service to a much larger number of requests than traditional servers like Apache HTTP Server. No Buffering − Node.js applications never buffer any data. These applications simply yield the data in lumps.